When Chestnut Tree Children’s Hospice in Arundel were gifted an acre of woodland, they turned to Greenfingers Charity to help them transform this neglected and unusable space into a beautiful, peaceful retreat. They required a little or no maintenance garden with no steep changes of level, or steps, and one which passed strict health and safety measures for children, their families and carers who spend time at the hospice to enjoy. In June 2014 Greenfingers Charity opened The Woodland Walk Garden, the first garden to be built as a result of our ‘Rosy Cheeks’ appeal. 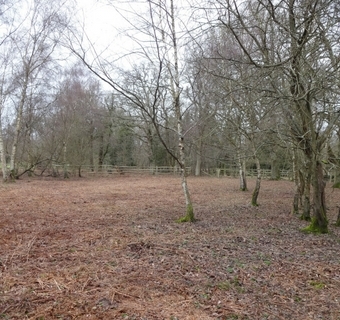 Designed by Award winning garden designer and Greenfingers Charity’s Patron, Ann-Marie Powell and built by Garden House Design (with support from the BNY Mellon and HSBC) the woodland is unrecognisable from the muddy, overgrown space it once was. It is now enjoyed by over 300 life-limited children and their families from East and West Sussex, Brighton, Hove and South East Hampshire who are cared for at the hospice. 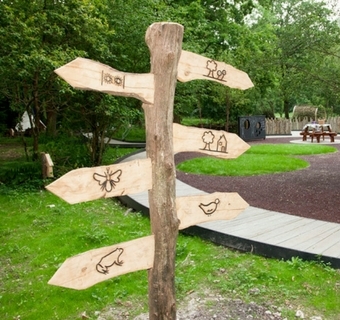 Children, their families, siblings and carers can explore the The Woodland Walk Garden up close from a safe, non-slip and wheelchair friendly boardwalk where they are able to sense the sounds, smell and sights that the woodland brings. 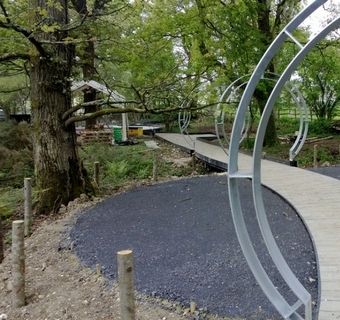 Ann-Marie designed several spaces that are cleverly connected by winding paths through the giant Oaks and Birch trees, with plenty of places to explore with all the benefits this brings the children from spending time outside away from the hospice buildings. One pathway leads to a treehouse nestled in the canopy of the trees where children can enjoy being high up in the woodland surrounded by fresh air and birdsong. 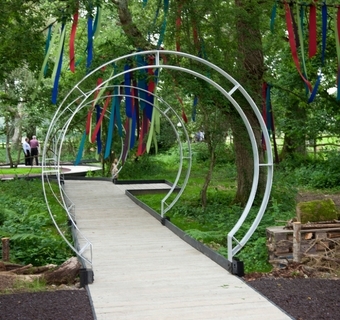 Another path leads to a natural clearing of circular decks with tables and chairs where families can spend special time together perhaps enjoying a picnic or just simply somewhere for parents to have break away from the bedside of their child. Giant blackboards for drawing pictures of nature or noting wildlife glimpsed, a plant amphitheatre where children can feel the textures of mosses and ferns, bug houses and wooden sculptures of foxes and deer and wooden dens bring the outdoors to life. Two much loved features are a copse of telegraph poles for wheelchairs to pass through at a zig zag and the ‘hanging garden’ of strips of bright and colourful fabric that gently brush the children’s faces as they pass through. If you have been inspired by the Chestnut Tree House garden and would like to support Greenfingers Charity, please email linda@greenfingerscharity.org.uk or telephone 01494 674749.